A man has suffered a fractured eye socket as he was attacked with an iron bar by three masked men in Londonderry. The 28-year-old was assaulted in an alleyway in the Cooke Street and Corporation Street area of the city at around 10pm on Friday. Detectives with the PSNI are appealing for information following the assault that also left the victim with bruising to his body. The attackers were wearing dark clothing and had their faces covered with scarves. Detective Constable Richard Donnell appealed for anyone who witnessed the incident to contact detectives at Strand Road. Meanwhile, a woman and her young child escaped injury after their Belfast home was damaged in an arson attack. The fire started in the garden of the house in Ballysillan Avenue on Saturday morning and spread to the side of the property and caused smoke damage. There were also reports that damage was caused to a nearby electricity box and gable wall. 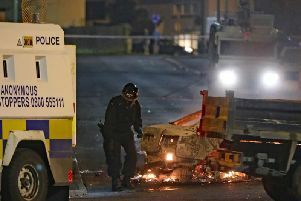 A PSNI spokesman said: “At around 6.05am, it was reported there was a fire in the garden of a house in the area. “It is understand a female resident and her young child were inside the property, but were not injured. “Inquiries are continuing but the fire is being treated as deliberate. It came hours after a fire damaged a house in east Belfast. Police believe entry was forced to the house in Dunraven Court on Friday night. A spokesman said: “Shortly before 8.40pm, we received a report of a fire at a property in the area. “Police believe entry was forced and considerable damage was caused to the property as a result of this fire. “Thankfully, no one was inside the premises during the incident. Northern Ireland Fire and Rescue Service attended and extinguished the fire.